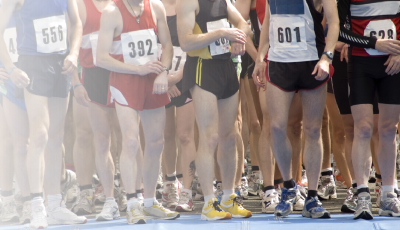 Racebibs and race numbers for marathons, triathlons, adventure races, fun runs, and school events. Cycling numbers and stickers for bike events, products include cycling bibs, bike plates, seat-post stickers & helmet stickers. Event products, products include customised labels and bag tags and personalised certificates just to name a few. Plastic Business Cards, Promotional flyers, posters, entry forms and any other printing needs. Standard Stock – A great price & top quality, 120gsm waterproof & tear-resistant polypropylene. Deluxe Stock – Highest quality, 170gsm waterproof & tear-resistant polypropylene. Premium Stock – Waterproof, 150gsm tear-proof & heat resistant. Better suited for extreme events. Eco Stock – Environmentally friendly water & tear-resistant Recyclable & Biodegradable. Standard Sticker – Water-resistant removable paper adhesive. Premium Sticker – Tear-resistant & waterproof removable synthetic adhesive. Certificates with competitore names & finishing times. 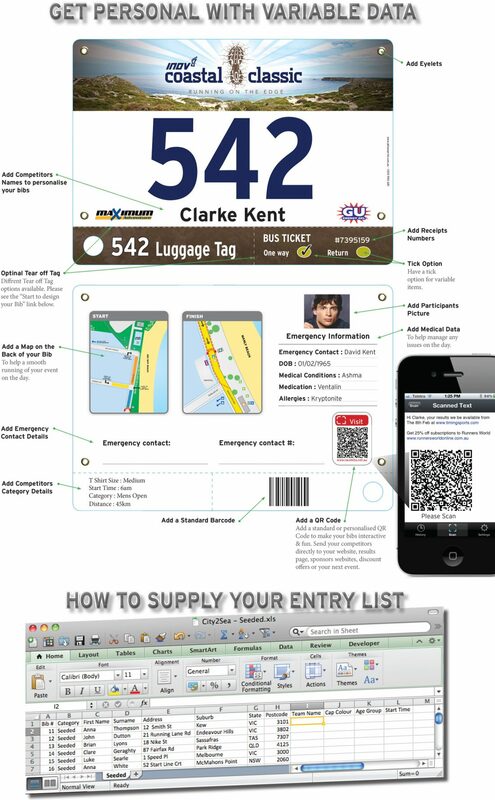 We also offer packing & distribution of your race material – packing race kits with matched shoe timing tags or attaching timing tags to bibs, envelope address printing & barcoding. We direct mail at discounted postal rates, please ask us about this service. Check out our Samples for some design ideas. Pick your race bib colours from our Colour Chart. Race Bibs Tear off Tag options. Below are some of our standard sizes for running & cycling bibs, if you have a differnt size in mind please let us know as we can produce custom sizes to suit your event & needs. Running Bib – 148mm x 210mm (Standard) / 145mm x 148mm / 180mm x 210mm. Cycling Bibs – 145mm x 148mm / 160mm x 180mm / 148mm x 210mm.